Former Senator Bob Graham Urges Obama to Reopen Investigation into Saudi Role in 9/11 Attacks | Democracy Now! former Florida Democratic governor and U.S. senator. As chairperson of the Senate Select Committee on Intelligence, a post he held on September 11, 2001, he headed the Congressional Joint Inquiry into the deadly hijackings. His newest book is called Keys to the Kingdom, a fictional suspense novel with real-world insights. Web ExclusiveSep 11, 2012The 9/11 Decade: Timeline of Voices of Dissent on Democracy Now! JUAN GONZALEZ: Former Florida Senator Bob Graham is calling on President Obama to reopen the investigation into the September 11th attacks after new information has emerged about the possible role of prominent Saudis in the 9/11 attack. According to recent news reports, a wealthy young Saudi couple fled their home in a gated community in Sarasota, Florida, just a week or so before 9/11, leaving behind three cars and nearly all of their possessions. 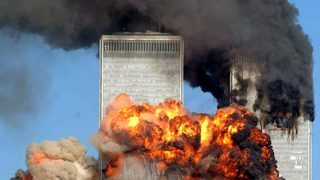 The FBI was tipped off about the couple but never passed the information on to the September 11 Commission, even though phone records showed the couple had ties to Mohamed Atta and at least 10 other al-Qaeda suspects. AMY GOODMAN: Back in 2004, documentary filmmaker Michael Moore drew attention to the fact that the White House had also approved planes to pick up the bin Ladens and numerous other Saudis shortly after the Twin Towers were hit. In this clip from his documentary Fahrenheit 9/11, Michael Moore speaks with Democratic Senator Byron Dorgan of North Dakota, who was on the Senate Subcommittee on Aviation at the time. SEN. BYRON DORGAN: We had some airplanes authorized at the highest levels of our government to fly to pick up Osama bin Laden’s family members and others from Saudi Arabia and transport them out of this country. MICHAEL MOORE: It turns that the White House approved planes to pick up the bin Ladens and numerous other Saudis. At least six private jets and nearly two dozen commercial planes carried the Saudis and the bin Ladens out of the U.S. after September 13th. In all, 142 Saudis, including 24 members of the bin Laden family, were allowed to leave the country. AMY GOODMAN: That was a clip from Fahreneheit 9/11 by Michael Moore. We’re joined now by former Florida governor and senator, Bob Graham. He’s in Washington, D.C. As the chair of the Senate Select Committee on Intelligence, a post he held on September 11, 2001, he chaired the Congressional Joint Inquiry into the deadly attacks. He has just written a novel called Keys to the Kingdom. Senator Bob Graham, welcome to Democracy Now! Let’s start with this new information that we have learned. It may not be new information to the government, but talk about this Saudi couple in Sarasota, Florida. BOB GRAHAM: Thank you, Amy, and good morning. One of the questions around 9/11 is whether these 19 hijackers were operating alone or whether they had a support network that assisted them and gave them anonymity. It’s been my feeling that it was very unlikely that they could have been successful without such a network. We know a great deal about the network component that existed in San Diego. What we’ve just learned is about another pod of this network in Sarasota. What we know to date is that there was a wealthy Saudi family living in a gated community near Sarasota, which had numerous contacts with Atta, the leader of the hijackers, and two others who were doing their pilot training near Sarasota. We also know that this family left the United States under what appear to be very urgent circumstances on August the 30th, 2001, just before 9/11. JUAN GONZALEZ: And is there any indication why this information was never revealed to the September 11th Commission? BOB GRAHAM: No, but the same was true in San Diego. The FBI, although they were asked to provide the congressional inquiry all the information they had about 9/11, did not tell us about these extensive contacts—contacts in San Diego. It was because we had a very curious and effective investigative team, which went to San Diego and was able to uncover the relationship between, particularly, a key Saudi agent living in San Diego and the first two hijackers to have entered the United States. JUAN GONZALEZ: Now, this is not—you have raised in the past concerns about a possible Saudi involvement with the hijackers. Could you talk about how your concerns have arisen over the years? Obviously you’re privy to information as a former head of the Senate Intelligence Committee that the average American or even the average politician or member of Congress is not. But why you have had these concerns? BOB GRAHAM: Well, it started with the disbelief that 19 people, most of whom didn’t speak English, had never been in the United States, could have come here, plotted, practiced and then executed such a complex plan as 9/11. My assumption had been that they had some support system that was already in place in the United States, which facilitated their activities. We learned a lot about such a facilitation in San Diego. Now we’re beginning to learn about Sarasota. The question in my mind is, what happened in places like Arlington, Virginia; Paterson, New Jersey; Phoenix, Arizona; Delray Beach, Florida, where we know hijackers lived for a considerable period of time? Were there similar facilitators in those communities? AMY GOODMAN: Explain who Bassnan is, and Bayoumi, and their relationship in San Diego. BOB GRAHAM: Yeah. Right after the first Persian Gulf War, the monarchy in Saudi Arabia became very concerned that they were going to be the next Iran, a youth-led revolt. In order to avoid that, one of the steps they took was to begin to establish monitors in those areas of the world where there were significant number of Saudi youth, particularly college and university students. One of those places was San Diego. The man who was listed by the FBI, described prior to 9/11 as a Saudi agent, had the responsibility of that monitoring in Southern California, but he also, in January of 2000, took on a second task, which was to provide assistance to two Saudis who had recently entered the country. We know that they had been very important and experienced operatives of al-Qaeda, because, among other things, they had just attended a summit of terrorists held in Kuala Lumpur, Malaysia, the first week in January in 2000. Bayoumi, the agent in San Diego, and Bassnan, who was the successor to Bayoumi, provided substantial assistance to these two men. Now, it appears in Sarasota that it may not—that the facilitators may not have come from the same network of persons who were monitoring students, but rather from people who were close to the royal family and were considered reliable and who were given this assignment of helping hijackers. AMY GOODMAN: Can you talk, Senator Graham, about the 9/11 Commission and the suppressed pages of that commission, what you believe is in them, and if it links to the Saudi royal family? BOB GRAHAM: The suppressed pages were in the Congressional Joint Inquiry. We worked diligently throughout 2002 to gather as much of the information as we could and to make recommendations. We had an 800-plus-page report, one chapter of which, which related primarily to the role of the Saudis in 9/11, was totally censored. Every word of that chapter has been denied to the American people. One of the reasons that I wrote a novel, Keys to the Kingdom, was because I felt that that was a means of beginning to tell the American people some of the things which they have not been able to be told because of the degree of cover-up that has surrounded the Saudi activities in the United States prior to 9/11. JUAN GONZALEZ: And your novel is based on a fictional former senator from Florida who’s basically involved in trying to ferret out the secrets that the rest of the public is denied knowledge of? Could you talk a little bit about the novel? BOB GRAHAM: The novel does commence with a retired U.S. senator who’s living in Florida, who is obsessed with the unanswered questions of 9/11. He contacts a young intelligence officer who had previously worked with him in the inquiry into 9/11 and asks if he will come to Florida to discuss what the senator’s concerns are and some ideas of how to find those answers. The senator also writes a very detailed memorandum, which he would use for his discussion with the young man. Unfortunately, before that meeting can take place, the senator is killed in a very suspicious hit-and-run accident. That event starts the action of the novel, as the young intelligence officer reads the memo, agrees to undertake this assignment, as well as attempting to find out who killed Senator Billington. AMY GOODMAN: Now, you had written in 2004 a non-fiction book called Intelligence Matters that was heavily censored. Is this why you’re choosing to write a fictional book now that actually deals with a number of the issues that you were not able to get out more than five years ago? BOB GRAHAM: Yes. The standards of censorship are much lower if you are not representing the book to be reality, but rather fiction. The fact is, the Keys to the Kingdom, about 40 percent of the material is truth, with the exception that I changed the names of most living people. Another 40 percent is fiction, and 20 percent is a blend. JUAN GONZALEZ: Now, you’ve been critical of the Bush administration—the second Bush administration and its handling of the aftermath of 9/11, specifically in terms of beginning to develop the plans for the invasion and occupation of Iraq. Could you talk about how you reached these critical conclusions and what affected you in terms of taking that stance? BOB GRAHAM: Well, the first concern about the degree of cover that has been given to the Saudi relationship around 9/11, there are multiple instances in which the Bush administration precluded the official investigators, a citizens’ 9/11 Commission and our commission of the Congress, and denied to the American people information which was not of a national security level, but rather could have been politically embarrassing. A year after 9/11, the Senate was debating whether to authorize the United States to go to war against Iraq. I was strongly opposed to that, first because I thought that it would be a diversion from Afghanistan, which should have been our priority, and second, that the evidence that had been submitted on weapons of mass destruction was highly suspect. I’m afraid that, as it has turned out, the fact that we are still in Afghanistan 10 years later is in large part because we shifted our focus to Iraq, and, of course, there were no weapons of mass destruction in Iraq. AMY GOODMAN: Bob Graham, if you could speak more about the Bush administration’s relationship with the Saudi royal family and the bin Ladens in the Saudi royal family, as well as others, what the relationship was, what was being protected, who was allowed to get out of this country after September 11th, and who wasn’t? BOB GRAHAM: There are a number of suggestions as to why did the Bush administration engage in such a comprehensive cover-up. One of them is the close family relationship, which goes back to the president’s grandfather, Preston Bush—Prescott Bush, and the Saudi family. Another reason is for since ever—ever since World War II, the United States has had an understanding with the Saudis that they would provide us with oil, we would provide them with defense assistance. So, you can pick which reason you think explained it. A more current reason was that the United States, after 9/11, was obsessed with the question of—or avoiding another attack. And the feeling was, we can’t antagonize an important Middle Eastern country that may be able to give us good intelligence and other assistance in avoiding that other attack. All those are speculative, and history will have to come to the answer of which one really describes the basis of the Bush administration’s cover-up. As to the Saudis who escaped, the Michael Moore movie accurately depicts it. Prince Bandar, the ambassador to the United States from Saudi Arabia, shortly after 9/11, within hours, went to the president and asked that Saudis who were in the United States, who felt that they might be subjected to some kind of adverse treatment because of the public attitude, knowing that 15 of the 19 hijackers were Saudi, that he asked if they could exit the country as quickly as possible. The president approved that, even though domestic aviation in the United States was shut down. And approximately 140 Saudis, including several members of the bin Laden family, left. The FBI later stated that there were people on that plane that the FBI would have desired to have interviewed before they left the United States but were denied the opportunity to do so. JUAN GONZALEZ: Now, you have called on the Obama administration to reopen the investigation, but given the original 9/11 Commission Report, your joint inquiry, what body or what group of people do you think would be independent enough to be able to conduct an investigation that could lay to rest all the many questions that still exist among the American people about what happened on 9/11 and who was responsible? BOB GRAHAM: The White House is where this investigation should be conducted. The agencies that are involved are all executive agencies, the leadership appointed by the president. The president has the capability of declassifying, for instance, the 28-page chapter, if it chooses to do so. It would only be if the White House was unwilling or unable to carry forward the answer to a number of secrets about 9/11 that I would advocate that some independent group outside of the executive branch be assembled to do so. AMY GOODMAN: Bob Graham, we want to thank you very much for being with us. Bob Graham is former Florida Democratic governor, as well as U.S. senator, founder of the Bob Graham Center for Public Service, former chair of the Senate Select Committee on Intelligence, a post he held on September 11, 2001. Graham’s newest book is called Keys to the Kingdom. It’s billed as fiction. The 9/11 Decade: Timeline of Voices of Dissent on Democracy Now!